This is a family cd with songs that appeal to the entire family. If John Denver and Jimmy Buffett did a kids album this would be it. Danny Quinn is a man who loves his job. Starting with rock ‘n roll in his teens, progressing to Irish and American Folk music in his later years, His love for his work comes across in both his live performances as well as his recorded works. “The Mighty Quinn” along with his brother Tim Quinn. After five years with his brother, Danny joined a group called “Stoutheart”, which was an Irish Folk group sponsored by Guinness Stout. guest of the Curtus and Kuby show on WABC radio in Manhattan. “For Family and Friends” is the name of Danny’s first solo album and was released in 1984. In August of 1987, “Overnight Success”, his second album, was released. His third album, “Time for Change” was released in 1989. “Gifts From a Bard” is a new album by The Danny Quinn Band which came out in early 1993. This all Irish album is dedicated to Tommy Makem and spotlights the musicianship and harmonizing ability of The Danny Quinn Band. Danny lives in Rockland County, New York. His latest band album is, “The Game”, which showcases the writing and performance talents of Danny, Bob, and Ronnie. 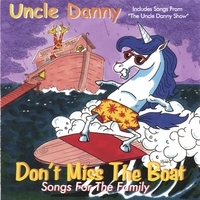 Danny also tours the U.S. with Tom Gardner as part of the Uncle Brothers doing childrens music. They have recorded two cds together including “Two Big Kids” and “Just Say Uncle”. “Two Big Kids” won the coveted Parents Choice award in the year “2000”. best version of Puff the Magic Dragon that I've yet heard ! Great Stuff !